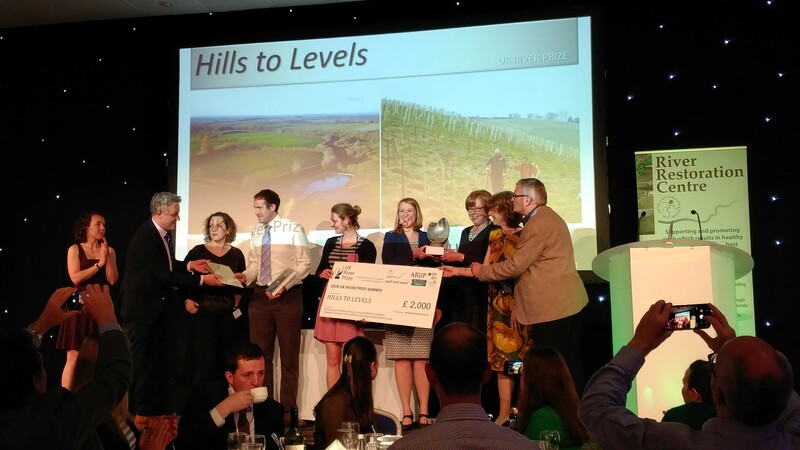 "Celebrating best practice in river restoration and catchment management"
'Hills to Levels' wins 2018 UK River Prize! "After Somerset became the focus for so much bad news and hardship as a result of the 2013/14 winter flooding, it is excellent to see such a well-coordinated approach has emerged to managing both the sources of flooding and poor river ecology. Such catchment-scale approaches need the level of commitment and enthusiasm that 'Hills to Levels' displays, to involve the huge number of landowners and to partner with them to make significant change happen. 'Hills to Levels' builds on previous catchment projects on the Tone and Parrett with a clear message that 'every field, every farm and every stream has a part to play'." 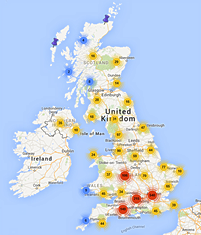 The Hills to Levels project involved one of the largest catchments (2871km2) implementing Natural Flood Management (NFM) in the UK, having experienced severe flooding, with changing climate bringing intense rainfall. Many streams in the area are failing WFD objectives for sediment, phosphate and fish; as well as being heavily modified. Measures have been installed to slow flow, filter sediments and store runoff, including floodplain reconnection, edge of field measures and leaky woody dams. 453 NFM structures have been put in place, including 232 woody structures. The Love Your River Telford project created a multi beneficial urban catchment management model, encouraging stakeholders and organisations to work together in partnership to improve water quality in Telford in Shropshire. It combines and compliments community engagement and physical improvements in an innovative way based around the Clean Stream Team. This project has combined the efforts of all stakeholders, sharing knowledge, experiences, tools and authority, to improve water quality and biodiversity while reducing flood risk and creating multiple benefits for the local community and businesses. The Connswater Community Greenway (CCG) project has created a park through east Belfast, aiming to connect green areas and revitalise polluted river systems on the Connswater, Knock and Loop Rivers. Extreme, intense rainfall events in Northern Ireland in the last decade caused widespread flooding in east Belfast. This project looked at bringing rivers 'back to life', involving the community, to create accessible, safe parkland for recreation and activities. The project included realignment of the Knock River involving moving the channel further into the park to improve access to the channel; as well as construction of river pathways, improving connectivity of the river to the surrounding landscape. The Tame Valley Wetlands Landscape Partnership (TVWLP) was formed in 2005 and brings together 23 organisations including local groups, wildlife charities, DEFRA Agencies, Parish, Borough and County Councils. This project developed a four year scheme, supported by the Heritage Lottery Fund, to restore the River Tame and its tributaries in the Tame Valley Weltands, located between Birmingham and Tamworth and part of the Humber River Basin. Although this project was not selected as an eventual category winner, the UK River Prize judges wish to acknowledge the considerable efforts and achievements of all involved in this project. This project led to the development of the Test & Itchen River Restoration Strategy identifying measures to improve the physical condition of the rivers, and move the SSSI unit towards favourable condition. The Trustees of the Tichborne Estate wanted to remove silt from an online lake within the grounds of Tichborne Park, and Aquascience Ltd developed an appraisal proposing the removal of silt to benefit the SSSI features of the site. 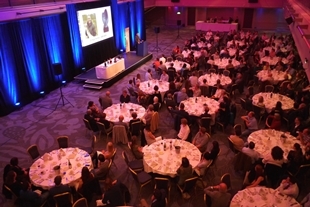 The 2018 UK River Prize Awards Dinner was held on 24th April 2018 at the EMCC in Nottingham. The winner was awarded the Nigel Holmes Trophy and a £2,000 cash prize, in front of 250 people. Each year the dinner is an inspirational and celebratory evening with a 3 course meal, premiers of the finalists videos and of course, the winners announcement. The Awards Dinner is run in association with the RRC Annual Network Conference. Find out about the 2018 River Champions, recognised for their hard work and effort to helping improve local rivers for wildlife and people.